CALIFORNIA LIVING® TV Magazine show with host Aprilanne Hurley has the inside look at money saving “home design hacks” that can make your home “look like a million” without spending a fortune in the process. Click here to watch select California Food, Wine & Travel CALIFORNIA LIVING® TV Magazine episodes on the official CALIFORNIA LIVING® YouTube Channel. “Find out why it’s just more fun…living in California”™ with CALIFORNIA LIVING® host Aprilanne Hurley Tuesday and Thursday mornings on ION Television. 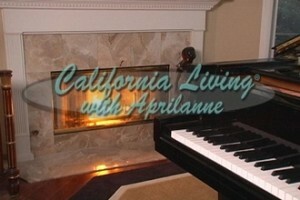 Tune in, tape it, TiVo it…just don’t miss out on all the CALIFORNIA LIVING® fun with host Aprilanne Hurley this season. Click here for CALIFORNIA LIVING® show days, times and Broadcast Television channel placement information. Aprilanne Hurley, CA Living TV, California Insider, California Life, California Lifestyle, California Living, California Living home, California Living Magazine, California Living TV, home design hacks, home hacks, Inside Look TV, money saving decorating ideas, money saving design ideas. Bookmark.